The U.S. Navy is the mightiest fleet in the world, but with the tides turning on fossil fuels, how will they expect to stay sustainable in the 21st century? The answer is fat. Gallons and gallons of it. except mixed with petroleum and multiplied by a warship. According to U.S. News and World Report, the Navy will not be able to run mainly on petroleum forever, and may have found the sustainable fuel source it was looking for - in beef tallow. 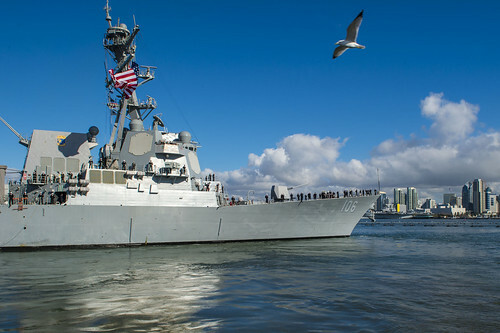 With the U.S. military firmly ensconced as the #1 expender of energy on the planet, with over one-third of that figure coming from the Navy, this "Great Green Fleet" idea is an auspicious start to a sustainably-fueled future. The Navy intends to derive up to 50% of its fuel from renewable sources, escalating the transition over the next four years. The U.S.S. William P. Lawrence, a guided-missile destroyer, is partially fueled by dead cow fat. The U.S.S. Stockdale, a guided-missile carrier, as well as three other ships will be switching to a mix of 90% petroleum and 10% biofuel, created from beef fat. This takes the pressure off of having to deal with fluctuating oil prices, hostile oil-bearing regimes, or fuel convoys that require the constant transportation of oil. The Navy is currently paying $2.07 a gallon for the biofuel, and has commissioned 77 million gallons. It's not rum, it's the future of floating and flying! what some good distilled cow can do. While some environmentalists may argue that using the effluvium of the already-environmentally-unsound cattle industry is unethical, the initiative is a step in the right direction for future fleets. The Navy intends to include solar and wind in their environmentally-conscious efforts as well. According to the Associated Press, some $500 million has been spent for the "drop-in" biofuels that can run in any current, unmodified engine of a naval vehicle. Both ships and planes are to be eventually converted to the mix. To be fair, our Navy used to be VERY good at the sustainable-windpower thing. "The Department of Defense and the military are realizing they would be more secure in terms of energy availability if they were relying on renewables more," stated Brian Korgel, a chemical engineering professor and solar-power researcher at the University of Texas-Austin. While some doubt the efficacy towards a better environment of a mere 10% dent in oil consumption, Navy Secretary Ray Mabus says that the mix will eventually be 50-50, as soon as it is more cost-effective. Other blends such as wood chips and landfill or food wastes may also accomplish the same goal as the tallow fuel. As competition in the industry heats up, there is confidence that prices will drop. "That's going to continue to expand as the biofuel industry ramps up," he said. As part of the deployment ceremony in Coronado, California on January 20th, he explained, "When it comes to power, my focus has been about one thing and one thing only: better warfighting...The Great Green Fleet shows how we are transforming our energy use to make us better warfighters, to go farther, stay longer and deliver more firepower. In short, to enable us to provide the global presence that is our mission." The U.S.S. Stockdale leaves Naval Air Station North Island for the West Pacific.